Here is another seedbox provider worthy to be noted as one of the affordable yet efficient seedboxes around. Seedbox Guide has done bittorrent client testing and trying all best features Seedboxer.net can give. The plan being tested was a 1000GB Speedbox Plan in a 1Gb/s connection with an unlimited bandwidth. 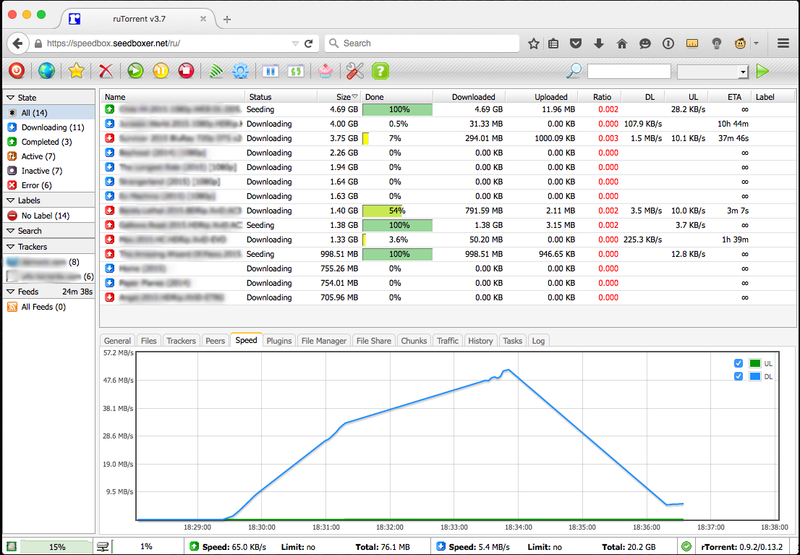 Seedboxer allows their clients to run in unlimited simultaneous torrents. This test seedbox is hosted in The Netherlands. Other Seedboxer plans they offer are available here: Seedboxer Plans. The test seedbox 1000GB Seedbox Plan is quite exceptional in terms of speed at the beginning which means it may perform better. Analyzing the illustrations below, it would give you an idea how would it reach around 50MB/s within 5 minutes of downloading 14 torrent files. However, it further shows that there are 11 files being downloaded while 3 files were downloaded completely. This affected the speed as it lowed down. You might ask what might be the possible step in order to download a torrent file quickly. You must consider your trackers and how many leechers and seeders available for the certain file to be downloaded. The illustration below doesn’t show the leecher-seeder ratio but you get the idea that most of the files don’t have that big number. If you notice the ratio, it shows a non-deal ratio. If you get a seedbox from Seedboxer, you will definitely be able to use OpenVPN. This can be another feature that Seedboxer offers in order to maximize your seedbox experience. It is enabled automatically and can be downloaded. Most seedbox providers don’t have this feature. At affordable price, you will get a remarkable seedbox usage. Seedboxer offers a good customer’s satisfaction which is always being guaranteed at its best. Quick, responsive and direct-to-the-point replies for technical and non-technical needs are being addressed appropriately. A quick response to our ticket opened would show their sincerity in discussing issues that other clients may encounter as they enjoy Seedboxer products and services. Seedboxer gives a detailed and easy-to-navigate dashboard where you can easily re-configure as an amateur user. The dashboard gives you easy access to the User info, manage username and password, your bittorrent client and the OpenVPN configuration and GUI. These are just few of the best features Seedboxer offers. Lastly, Seedboxer gives its user the capability to remotely connect to the bittorent client via a smartphone.